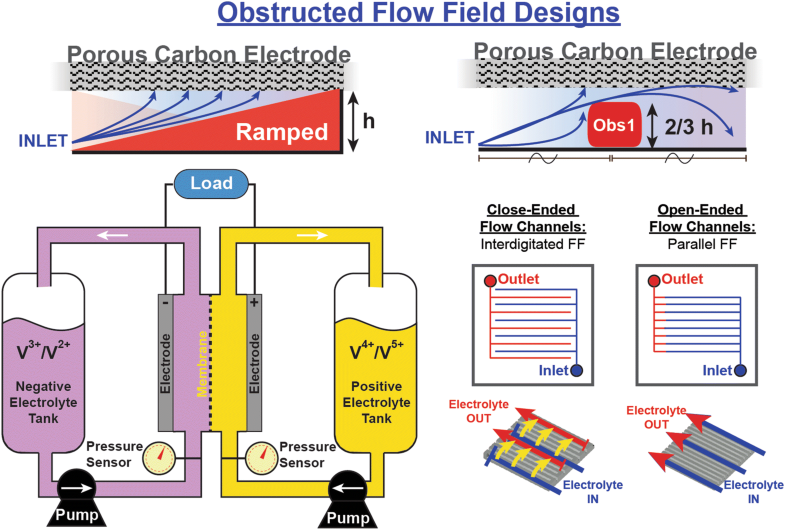 In this study, we have investigated the effects of varying flow channel depths and addition of various channel obstructions on the electrochemical performance and pumping power requirements of vanadium redox flow batteries (VRFBs). Specifically, 3D-printed ramps and prismatic obstructions were inserted into the channels of interdigitated flow field (IDFF) and parallel flow field (PFF) designs to observe the effect of non-uniform channel depth on the mass transport properties of open- and closed-ended flow channels. Results were compared with conventional flow field geometries. Integration of ramps into the closed-ended (i.e., IDFF) flow channels resulted in 15% improvement in peak power density (PPD) at a flow rate of 50 mL min−1. Addition of ramps to IDFF has also resulted in a significant 40% drop in required pumping pressure due to guided and gradual delivery of the electrolyte to the electrode plane. In addition, the effects of varying channel depths in open-ended (i.e., PFF) channels were found to be much more drastic with improvements in PPD up to 150%. Overall, findings of this study highlight the significance of varying channel depths on improving the mass transport characteristics of VRFBs and offer an alternative approach for design of high-performance flow cells. The authors would like to thank the National Science Foundation (Grant #1351161) for supporting this work. 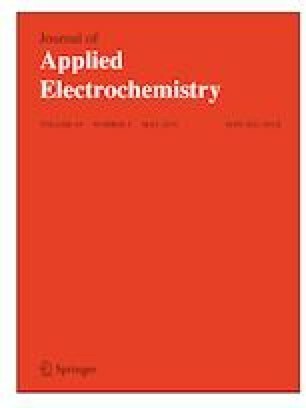 The authors would also like to acknowledge AvCarb Material Solutions for supplying the electrode materials.